JessFindsVintage feature in I (heart) Modern Treasury by Jill. 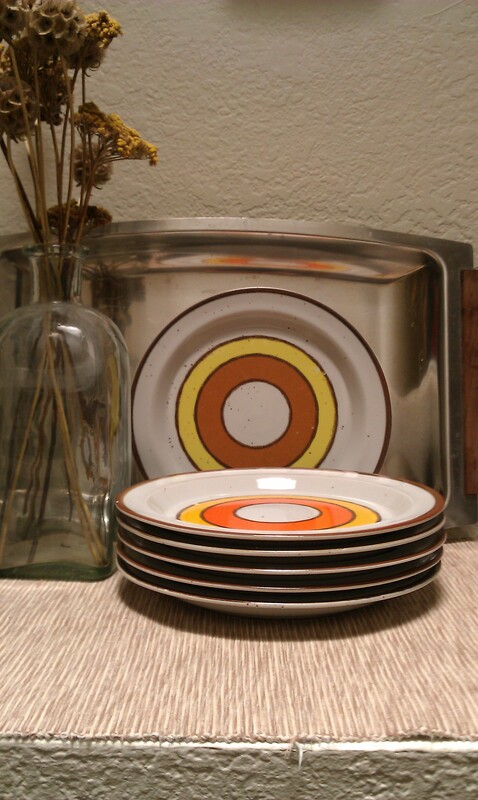 SIX These Vintage Salad Plates stoneware/ ceramic have Bright orange, yellow, brown and tan circles. They are a very cool Modern 60s or 70s pattern. They were hand painted in Japan. There are two patterns. One is the ORange and Yellow circles, the other is Brown and yellow with brown flecks. The both say Hearthside Buffet ware Japan. One has 654 No and the other 655 No, which are the pattern numbers. Very cool plates. They have normal vintage wear. Some scratches in the paint. One plate is shown with the color rubbing mark.